Auto-focus. We expect our cameras to do it, so why not our eyeglasses? At this year’s Vision Expo a press conference packed in hundreds of journalists, analysts and admirers to witness an historic First in prescription eyewear. Over ten years of research and development, culminated by PixelOptics and it’s emPower!™ partners, was right before our eyes. More correctly, it was right before the eyes of CEO Ron Blum, O.D., as he stood at the podium, wearing the world’s first pair of electronic prescription eyewear. Or, as strategic partner Bernard Pedoussaut of Aspex Eyewear Group described it, “the iPod of eyewear”. The first thing we noticed was that this very special pair of eyeglasses, a prototype for the line that is slated to become commercially available in a regional launch late this year, didn’t look special at all, sporting a sleek, normal-sized frame – precisely what the designers had in mind. But first let’s focus on the specs that made the spectacles especially interesting. 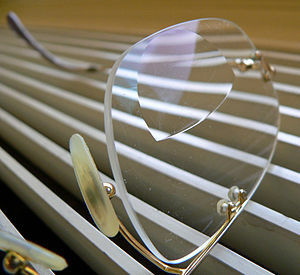 Like normal progressive bifocals, the glasses had one prescription for the main area of the lens, and a second prescription for the smaller inner area where one looks to read or examine something close. But unlike normal bifocals, the magnification of this inner zone actually increased at the whim of the wearer. These glasses were designed for presbyopia, a condition that affects many adults starting at around age 45 and results in the inability to properly focus the eyes at close-up and mid-range distances. For presbyopes, the closer the object you want to see, the more magnification you require. With traditional bifocals, the solution is less than clear. A prescription that focuses well in mid-range (14 inches to 7 feet) is not strong enough for really close objects; while an inner lens suitable for really close objects is too strong for the mid-range. Often these patients face an issue known as “peripheral swim”. Many adapt to this, but it is always a compromise – one which worsens as patients age. In any case this is problematic, says Dr. Blum, because “60% of the time or more, people don’t do close-work and don’t need the added (lens power)”. Dealing with this variation of focus in a small space is what lens companies have been doing for years, in lens products called “progressive addition” lenses. Globally approximately 50 million pairs of them are sold each year – 23 million pairs in the USA alone. The electronic eyewear, with the brand name emPower!™, solves this problem by electronically switching up the magnification when needed, and returning it to lesser magnification when not needed. This amazing feat is accomplished by a composite lens that combines traditional ‘static’ lens elements with ‘electro-active’ elements that changes the index of refraction (and therefore, the degree of magnification) at a speed faster than the blink of a human eye. Knowing our readers would want something more specific, BrandTech News checked out some patents and found that “…the term ‘electro-active lens’ refers to a lens whose optical properties may be changed or modified with the application of electricity. Of particular interest are electro-active lenses formed from liquid crystal lens elements…” Further description references use of either nematic or cholesteric liquid crystal components, used in conjunction with an electrical contact layer of Indium Tin Oxide (ITO) a clear conductive surface also employed in such technologies as electronic ink. The control is ingeniously implemented in three modes, all of which are inconspicuously activated by the wearer with a simple swipe or tap on the arm of the eyeglass frame. The frame is equipped with tiny batteries that can power the transitions for days at a time, depending on frequency of use, and ‘hibernate’ when the glasses are taken off and laid upside-down, to conserve power. Even more ingenious is the use of a micro-accelerometer, a tiny sensor that detects when the wearer tilts their head forward (as one usually does when looking at something up close) to automatically boost the power, then switches it back off when the wearer looks up again, restoring the glasses to the functionality of normal progressive bifocals. Alternatively, the operational mode can be switched to steady-on or off by different finger-swipes on the frame. Larry Rodriguez, SVP Global Marketing and Sales shared with me a conversation he had with Dr. Blum over 10 years ago. “Dr. Blum caught me in the hallway one day, excited as usual, and asked me a question I will never forget: what if we could take unwanted power out of the lens until the patient needed it, eliminating so much of the problem caused with progressive addition lenses?” Larry’s answer was “Wow, that would be great, but how is that possible?” That is the problem that PixelOptics has apparently solved with emPower. Dr. Blum describes the company as “a composite lens company and really an engine of innovation that none of us ever expected”. In 2005 PixelOptics licensed the intellectual property, trade secrets, and know-how exclusively and globally from e-Vision LLC, who had begun the development of electronic eyeglasses in the late 1990’s. From there they moved ahead with development partners from around the world. They claim to have amassed a portfolio of over 300 issued patents and patent applications. PixelOptics has received funding from Panasonic and some top-tier VC sources, and $3.5 million from the Defense Department for “SuperVision” technology development (a “wider clear vision” solution). Regarding pricing, which seems to pop into everyone’s mind when we tell them about this amazing new eyewear, Larry states that pricing will be up to the individual eye care provider, but that they expect it to be on a par with other premium progressive lens products. After the press conference, we made sure to stop by the PixelOptics booth to check it out for ourselves. The effect is indeed remarkable. Seeing was believing. Our final thought is that this – like QD Vision’s first product – is just the tip of an iceberg. Will PixelOptics partner with Apple or some other game-changer to deliver hands-free mobile computing by integrating it into eyewear, with voice, image, and gesture recognition? We find this electronic eyewear loaded with technological significance, not just because of the very real problem it addresses, but because it, and all the aviation and military eyewear-based solutions that already provide functionality but lack the consumer elegance of emPower, may be heralds of a not too distant future.